No scalable intervention has produced evidence of promise for ELLs to learn the language of science, technology, engineering, and math (STEM)—until now. 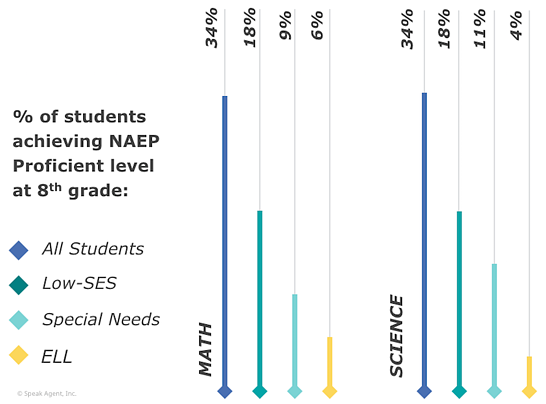 Two-thirds of all students do not achieve Proficient level on the NAEP Math and Science assessments in 8th grade. 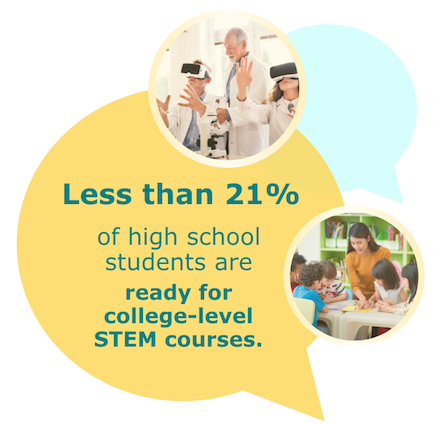 By high school, barely 1 in 5 meet the ACT STEM Benchmark, a measure that predicts a 50% chance of earning a B or higher in first-year STEM courses (ACT, 2017). For all practical purposes, this means that 4 in 5 students are essentially barred from pursuing STEM careers. Although the picture is even bleaker for special populations such as ELLs, students are underperforming across the board. Why? Math and Science require students to acquire complex and challenging new academic concepts, which require massive amounts of specialized vocabulary knowledge. A typical biology textbook, for example, introduces as many as 50% more new words than an entire semester of foreign language instruction (Armstrong & Collier, 1990). Laufer & Ravenhorst-Kalovski (2010) found that 95% vocabulary coverage is the minimum needed for comprehension of classroom instruction; 98% is optimal. Thus, success in learning key academic concepts requires knowing virtually all of the related vocabulary and syntax. Laufer & Ravenhorst-Kalovski also found that 64% of the variance in text comprehension scores among students was accounted for by content-specific word knowledge. Arya, Hiebert, & Pearson (2011) further found that science vocabulary knowledge was the only significant factor in comprehension of science texts. The need is broader than simply vocabulary, however. The language of STEM must include the context and syntax that make these words meaningful. As Bravo, Cervetti, Hiebert, & Pearson (2007) wrote, "Learning concepts in science occurs in a similar fashion as does vocabulary acquisition in literacy." Bravo et al. also found that "some science terms are more complex and demanding than others and require not only multiple exposures, but also exposures through multiple modalities for optimal and enduring word learning." Thus, the language learning strategies often used for ELLs can apply to STEM. That's because academic language is nobody's primary language. We are all language learners when it comes to the language of STEM! And without this critical language ability, students cannot access course content through texts, instruction, or class projects, nor can they adequately express themselves or demonstrate mastery. Existing computer-assisted interventions barely address the language of STEM. In fact, no scalable intervention has produced evidence of promise for ELLs to learn the language of STEM—until now. A two-phase study sponsored by the National Science Foundation found that Speak Agent is the first platform to accelerate acquisition of second-grade science concepts and related vocabulary by more than 3X with a significant effect (Li, 2018). The Speak Agent research team is actively testing at secondary grade levels during the 2018-19 school year. 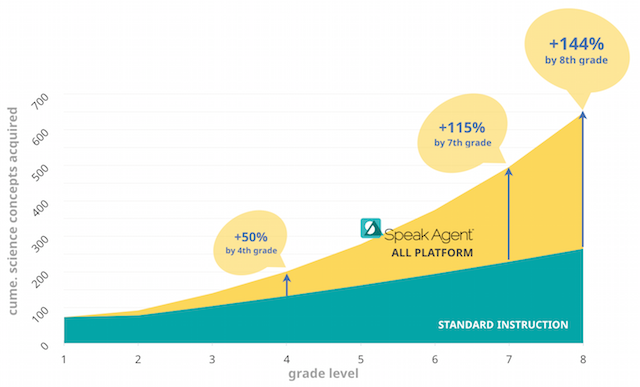 If Speak Agent were able to reproduce the gains made in second grade through higher grade levels, relative to the control group's gains, it would have a profound effect on learning and a life-changing impact. By extrapolating the results from the two-phase NSF-sponsored study and the Maryland assessments, the chart below shows the potential impact on student acquisition of key science concepts. The extrapolation is based on the assumption that the results may be reproduced in a scalable way and that the results translate to other grade levels and subjects. Similar results with reading concepts in the Maryland assessments suggest that the results are likely to translate across subject areas. Speak Agent is currently planning research to corroborate the initial findings at a larger scale, to determine the impact at secondary grade levels, and to measure distal education outcomes such as summative assessment scores, grades, and graduation/career outcomes. Please see our References page for a full A to Z listing of all research cited on speakagent.com.